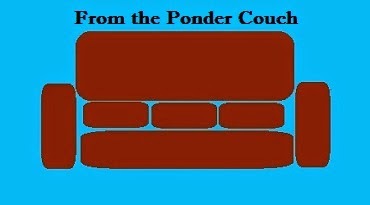 From the Ponder Couch: Clutter: My 3 Favorite Cluttered Comic Artists! Clutter: My 3 Favorite Cluttered Comic Artists! I like Comics! And I like Clutter! So I combined the capital C's in my interest... wheelhouse... So here's my top 3 Favorite Cluttered Comic Artists! Jamie was half of the comicing team who birthed Tank Girl. I found out about him through the Tank Girl movie. I loved the movie and checked out the comic because of it. The comic is much, much better. But I still have a lot of affection for the movie. 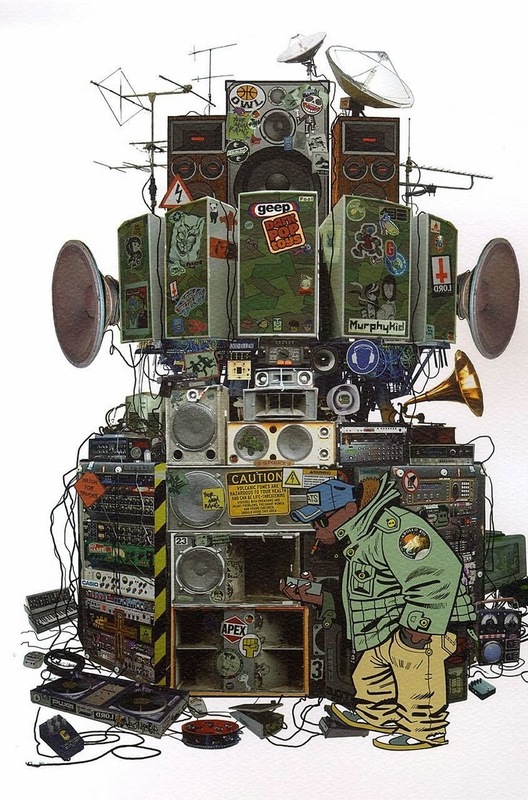 This is one of the most common pics of Tank Girl (at least according to my google search), and it is a perfect example of the kind of clutter Hewlett packs into his drawings. There is lots of weapons, stickers, roundels, tattoos, stickers, toys, and numbers. There is even a band aid, which I think always look cool in comics but bulgy and gross in real life. I like the Gorillaz's hit songs, but I've found the other tracks harder to get into. I still love Hewlett's visuals. In the pic above you can see lots of stickers and speakers and even a gramophone. Awesome clutter. Purcell is most well known for Sam and Max Freelance Police in all their various media. I found out about him/them/it through the Lucas Arts game "Sam and Max Hit the Road". I love everything Sam and Max because it is always funny and quirky and great. Their comics, cartoons, and games are also always cluttered. Especially any scene involving their office. This particular picture is one of those "what doesn't belong" kind of picture, but it is a perfect example of the kinds of things Purcell clutters into his panels. Toys, weapons, rats, insects, kitschy souvenirs, junk food, and a dartboard full of things besides and including darts.﻿ Basically, everything I love. Dorkin draws amazing comics that are amazingly cluttered. I found out about him through Marvel's Bill and Ted comics, but he is probably best known for Milk and Cheese. I love all of Dorkin's work, from Bill and Ted to Milk and Cheese to Hectic Planet to his writing for "Space Ghost Coast to Coast" and "Beasts of Burden". One of my favorite things he has done/is doing is his "Eltingville... Club" which is all about nerds and geeks and the objects and properties of their obsessions. Here is the excellent pilot for "Welcome too Eltingville"
Dorkin's clutter includes pretty much everything I've listed above plus Fisher Price Little People, alcohol, and t-shirts of bands I love. He truly is the best Clutter Comic Artist! 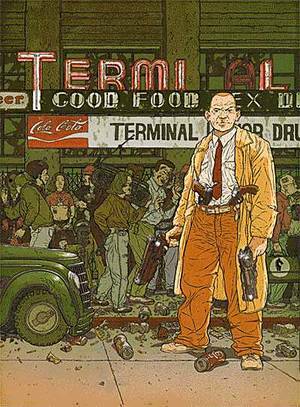 I know Darrow's work from Frank Miller comics. My favorite is "Hard Boiled". He would've made the top 5, if I could've come up with a 5th (but I like the number 3 better). The only thing about Darrow is that his comics are almost too cluttered. He includes more details in his pictures than my eyes can focus on and my brain can process. He has everything above plus an unhealthy amount of advertisements, rubble, blood, sweat, scars, veins, and all that other gross stuff that you saw in the close-up shots in Ren and Stimpy cartoons. But unlike Spumco stuff his gross stuff is in EVERY PANEL. If you are a big fan of that kind of stuff, check out Darrow's work. For more clutter read THIS and THIS! Project CALVIN and HOBBES: Hobbes Cosplay! A Collection of Common Background Songs part 3!